Heading south towards Silverton the San Juan Scenic Skyway dramatically clings to canyon walls of the Uncompahgre River. This is the white-knuckle portion of the drive for flatlanders and those unfamiliar with mountain driving. Tunnels, snow shed, waterfalls, rugged red peaks and rusty-orange mine tailings hold our interest as we wind our way to the top of Red Mountain Pass. 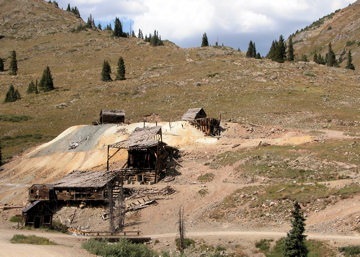 One of the richest mining districts in the world around the turn of the 20th century, Silverton was known as a wild town, notorious for gambling, drinking and the Blair Street red-light district. 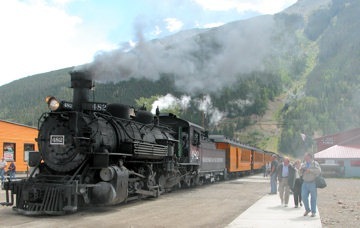 Today, excitement peaks with the arrival of the Durango and Silverton Narrow Gauge Railroad in a mighty puff of black smoke. Hundreds of passengers descend on shops, restaurants and bars for two hours of modern day carousing. During mid-day when the town teems with train passengers, we head to the Old Hundred Mine for an underground tour considered one of the best in the state. Everyone dons hard hats and yellow slickers before boarding the electric mine train. 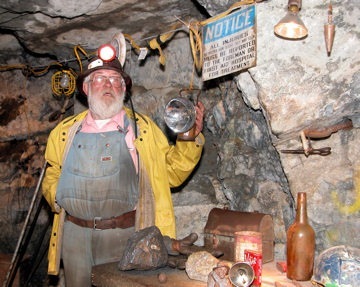 Journeying 1/3 mile into Galena Mountain the one-hour tour is guided by an experienced miner. While he demonstrates the use of jack-leg drills, mucking machines and slusher the reverberating sounds give a harsh reality to the quest for ore.
Progress southward to Durango is slowed for photographers wanting shots of Molas Lake, Engineer Mountain, Coal Bank Pass, and Durango Mountain Resort. Could it be time for another soak, this time at Trimble Hot Springs, six miles north of town? Surrounded by landscaped gardens and shady lawns the soaking pools invite total relaxation. Active youngsters and those seeking real exercise gravitate to the Olympic-sized swimming pool. Massage and spa treatments can extend the stay for an indulgent day in the shadow of red sandstone mesas. 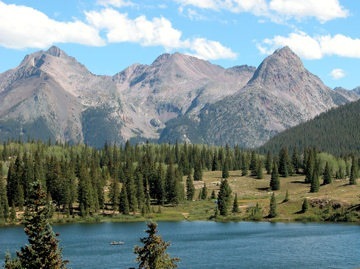 Durango serves as commercial, educational and tourism hub for Southwestern Colorado and the entire Four Corners region. Rich in history yet vibrant with youthful energy, the city offers options for all. Kayaking, rafting, mountain biking, fishing, golf – outdoor recreation is a way of life. Dining choices demonstrate the community’s diversity. One evening we choose Bar D Chuckwagon with barbeque dinner and Western entertainment by the Bar D Wranglers. The next night we’re downtown on the quiet patio of Seasons Grill savoring Alaskan halibut with saffron aioli and risotto cake. After dinner shopping includes stops in outdoor outfitters and art galleries. 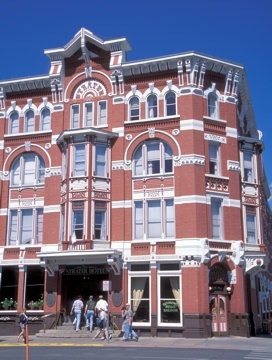 And, who can resist the ragtime tunes and honky-tonk piano at the Diamond Belle Saloon in the Strater Hotel – distinctively Durango. Heading south towards Silverton the highway dramatically clings to canyon walls of the Uncompahgre River. This is the white-knuckle portion of the drive for flatlanders and those unfamiliar with mountain driving. 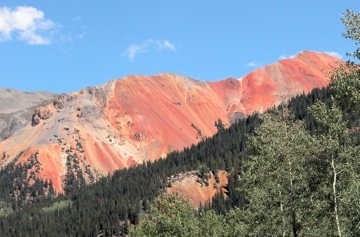 Tunnels, snow shed, waterfalls, rugged red peaks and rusty-orange mine tailings hold our interest as we wind our way to the top of Red Mountain Pass. This post is a portion of an article by Nancy Yackel first published in Buzz in the ‘burbs, a suburban Denver monthly.